The Raven Boys | What YA Reading? From Maggie Stiefvater, the bestselling and acclaimed author of theShiver trilogy and The Scorpio Races, comes a spellbinding new series where the inevitability of death and the nature of love lead us to a place we’ve never been before. 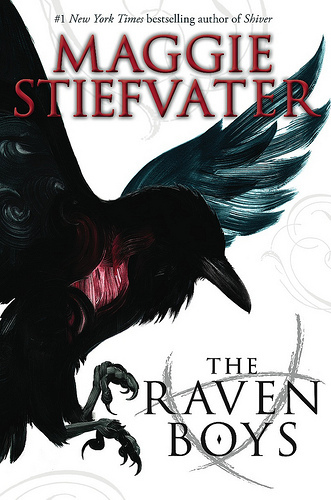 I’m going to be horribly honest with you: I didn’t like Shiver, Stiefvater’s most popular series. Sure, it had its high points, but… it just wasn’t my cup of tea. Also, how many books do we have to read wherein the male lead’s name is Sam? We get it, it’s an attractive name. But there are other attractive names out there. My current favourite attractive name: Richard Gansey III. Or, shortened, Gansey. That is definitely the name to suit the dreamboat that is The Raven Boys‘ doomed love interest. ‘Doomed?’ you ask, ‘why?’ The answer is simple: if Blue kisses him, he’ll die. Not that Blue wants to kiss him. No, Blue likes Adam. Honorable, honest, master-of-his-will Adam. I don’t pretend to understand. Complete with magical forests, holy ruins, and very made-over, very cluttered manufacturing warehouses, The Raven Boys‘ world building is so obviously top-notch. I believe that we are even introduced to a pack of unicorns at some point the novel. Yes, you heard me, unicorns. There just aren’t enough of those to go around these days. Speaking of shortages in current YA novels, I love how respectable these Raven boys are. I know that I’ve mentioned this a thousand times before, but bad boys? They’re great once in a while. 24/7, though? I’m sorry, but that doesn’t work for me. Passionate for the supernatural, well-intentioned and downright genteel, you don’t need to be a clairvoyant to know that Gansey is so clearly my soulmate. But even Ronan, the most malicious of our main characters, is good at heart. I appreciate that. It’s these complex layers in every character that really have me hooked, though. Take Adam, for example. Adam is in a constant battle with himself and his friends, fighting for his free will. Because he’s scholarship student at Aglionby Academy, he works way too many jobs; he also has quite a few problems at home. Being a friend to three rich boys, he could have it so easy. But he won’t take their charity. Ronan, on the other hand, has a murdered father, a suddenly mute mother, and a hateful brother. His resulting personality is prickly and bitter. Moreover, he’s failing out of school. But there’s so much more to any of them than that. Maggie Stiefvater somehow manages to incorporate a hauntingly beautiful tone to her writing, noticeable through these subtle nuances in her characters. Every page, every line of The Raven Boys is stained by her dry wit and equipped with the ability to make you pause, wondering what is just below the surface. Long-time fans of Stiefvater will tell you that the author comes through once again with sleepy folklore, a cast of characters developed to leave an impression, and an unforgettable conclusion deemed worthy of the rest of the novel. And I will back them up. 4.99/5 stars.